Courtesy of The Agency, John K. Herkenrath. Least costly new home in Calabasas. 2.67 acre approved horse property & ability for 1200sf guest house and/or custom hardscape/sport court. Move-In-Ready, New Construction 5897sf Home conveniently located in Stokes Canyon by iconic Mulholland Hwy, 1 mile from Las Virgenes. Minutes to Malibu and Hwy 101 for easy access to Valley. 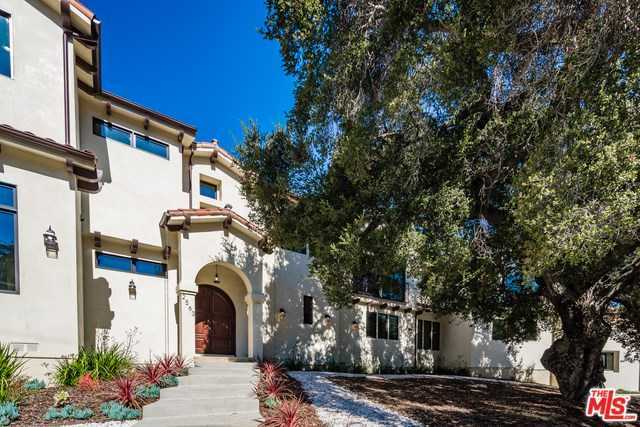 Authentic Spanish style home with Oak Trees and panoramic, canyon & mountain views. Country setting adjacent to natural trails with 40+ year residents, brand new home just sold next door. Open floor plan w/soaring ceilings, much natural light flowing through the expansive chef’s kitchen, dining and family rooms, theatre room, ground floor bedroom w/ En Suite Bath. Chilled wine room. Folding glass patio doors, spacious outdoor living area w/ covered patio & outdoor kitchen. Pool & hot tub. Dry sauna & steam shower. Upstairs guest suite & 3 En Suite Bedrooms. Master suite walk in closet, master bath with soaking tub & fireplace with deck. 3 car garage. Please, send me more information on this property: MLS# 18375242 – $2,799,000 – 2563 Stokes Canyon Road, Calabasas, CA 91302. I would like to schedule a private showing for this property: MLS# 18375242 – $2,799,000 – 2563 Stokes Canyon Road, Calabasas, CA 91302. © 2019 Jennifer Camp — Compass. CA DRE #1021828 All Rights Reserved. Real Estate Website Design powered by Home Junction.